Under the Food From Argyll banner, local producers are regulars at big rugby occasions at Murrayfield Stadium, Edinburgh. Big crowds are the norm and well-known faces do occasionally swing by for sustenance. 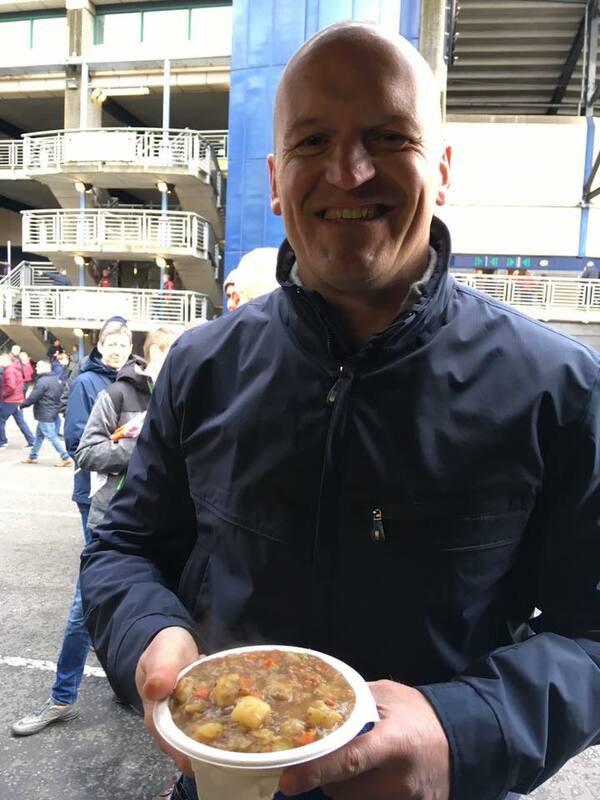 But even seasoned stallholders Alison and Ruaraidh of the Real MacKay Stovie Company were ever-so-slightly starstruck last Saturday when Scotland national rugby head coach Gregor Townsend dropped in for a plate of their famous stovies. Gregor was there to take in the European Champions Cup quarter final match between Edinburgh and Munster. ‘He stayed for a while for a blether. He’s a helluva nice guy,’ said Alison, from Inveraray. So much blethering was going on that a lady in the queue behind ‘Toonie’ had to wait patiently for her helping of stovies – none other than Scots songstress Barbara Dickson. Look out for the Real MacKay Stovie Company at summer events around Argyll, including Fyne Fest, Oban Live and Tiree Music Festival.